Applications are invited from gainfully employed Ex Armed Forces Commissioned Officers for an opportunity of donning the uniform and serving the nation as Territorial Army Officers (Non Departmental), based on the concept of enabling motivated Ex Service Officers to serve in a military environment without having to sacrifice their primary professions. You can serve the nation in two capacities – as a civilian and as a soldier. No other option allows you such an expanse of experiences. (a) Only Ex Service Officer can apply. (b) Nationality : Only male citizens of India. (c) Age Limits : 18 to 42 years on the date of application. (d) Educational Qualifications : Graduate from recognized university. (e) Physical Standards : A candidate must be physically and medically fit in all respects. (f) Employment : Gainfully Employed. Note : Serving member of the Regular Army/ Navy/ Air Force/ Police/ GREF/ Para Military and like forces are not eligible. DATE OF INTERVIEW : APRIL 2017 (Firm dates will be communicated later by post). Ex Service Officers to ensure their eligibility for the examination : The Ex Service Officers applying for the ASB Interview should ensure that they fulfill all eligibility conditions for admission to the Interview. Their admission at all the stages of the Interview will be purely provisional subject to satisfying the prescribed eligibility conditions. Mere issue of Admission certificate to the Ex Service Officers will not imply that his candidature has been finally cleared by the competent authority. 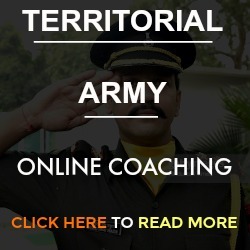 All desirous Ex Service Officers (Commissioned Officers only) of three services can download Application Form (IAF (TA)-9 (Revised) Part – 1) from www.indianarmy.nic.in (FREE OF COST) and send applications along with Photocopy of Release Order and Photocopy of Release Medical Board Proceedings to Additional Directorate General Territorial Army, Integrated Headquarters of Ministry of Defence, ‘L’ Block, Church Road, New Delhi – 110 001. Ex Service Officer should note that no request for change of date of Interview will be granted. The eligible candidates shall be issued a call up letter and will be sent by post by the Territorial Army Directorate. (a) The Ex Service Officers will be screened by the Army Headquarters Selection Board (ASB) held at Additional Directorate General Territorial Army, Integrated Headquarters of Ministry of Defence, ‘L’ Block, Church Road, New Delhi – 110 001. (e) Once previous service is verified from concerned PCDA (O) they are granted Ante-Date Seniority for Pay and Promotion. Ex Service Officers are required to bring the following documents in original alongwith attested copies at the time of interview. All those ex service officers whose complete documents are not produced for verifications will not be allowed to attend the interview. (a) Application Form IAF (TA)-9 (Revised) Part-2 to be downloaded from www.indianarmy.nic.in and fill it up in their own hand writing. (d) Copy of Identity proof with photographs (Voter ID/PAN Card/Passport/Driving license etc). (h) Self employed candidates are required to submit an Affidavit on Non-Judicial stamp paper of minimum value duly attested stating nature of employment and annual income alongwith photocopy of PAN card and self certified character certificate. (j) Ex Service Officers whose names vary in documents should submit copy of Gazette notification of India/ State showing the correct name or an affidavit duly supported by newspaper cuttings. (k) Copy of Release Order. (l) Copy of Release Medical Board Proceedings.